Laminate is made of printed sheets, in colorful patterns, wood grains and granite colors, adhered to a durable core material. The surfaces resist scratches and stains, making them ideal for high-traffic areas. 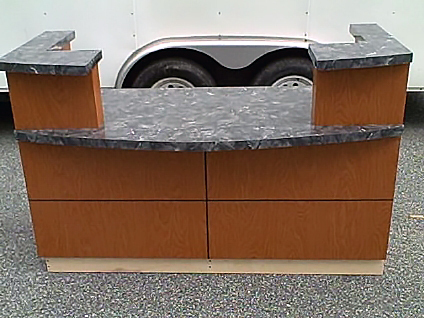 We specialize in building countertops, cabinets, kitchens, bathrooms, home and office furniture, entertainment centers, bars, tables, and bookshelves. We use only the highest quality materials and craftsmanship along with a great awareness for detail. From the initial design through completed fabrication, our service is based on integrity, courtesy, and communication with our customers. Our outstanding service, quality, and unique style are the reasons why Hallmark has completed scores of projects for home and business owners, architects, contractors, interior designers, and builders. In the end, you get state-of-the-art, creative and highly functional products that will meet the specific needs of your home or business. Please call or stop by the workshop and talk to our experienced staff about your specific project needs. Don't forget to visit our Photo Gallery page where you can get an idea of the work we do.